a fresh, fun and personal approach to weddings! Some weddings are based around a favorite throw cushion, a scarf, a postcard or a photo. And then some weddings have no choice but to be based around the dress. If you buy a dress that is not your typical bridal gown, you may want to go this route, I know that's what I will be doing, hoping that I find the perfect vintage antique lace Claire Pettibone gown. When I spotted this stunning Christian Dior couture gown I needed to set up some kind of scene for what type of wedding this could become. 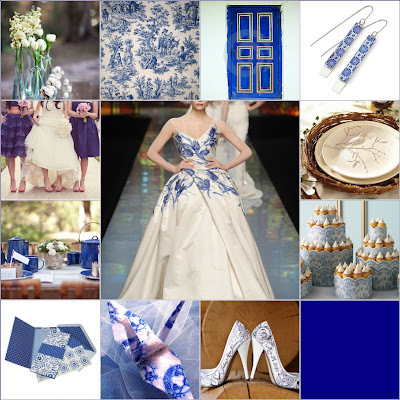 I despise royal blue - it reminds me of prom dresses - but mixed with lots of whites and hints of rustic brown elements it can really look crisp and fresh. Here's what I came up with based off this piece of art - now can someone PLEASE buy this dress and hire me to coordinate?! Thank you.